Modern,antique and shabby chic furniture and collectables. 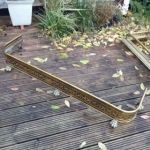 Furniture restoration. or by email at barnydbab@aol.com. 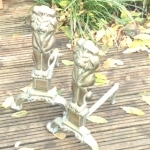 Pair of brass lion fire dogs for sale H44cm D29cm Brass and cast iron Ornate Fire Dogs. Fire Dogs are supportive bars which are put into a fireplace to hold logs up as they burn. They are extremely useful helping fires to burn more efficiently and safely. Firedogs have a strong crossbar which is supported by sturdy legs. The crossbar props up logs in the fire, pulling them off the bottom of the fireplace to ensure smooth air circulation. On one side, a firedog also has a supportive pole which keeps logs from rolling out of the fire as they settle during the burning process. As a general rule, people use two firedogs, one on either end of the fireplace, ensuring even support for fires as they burn.